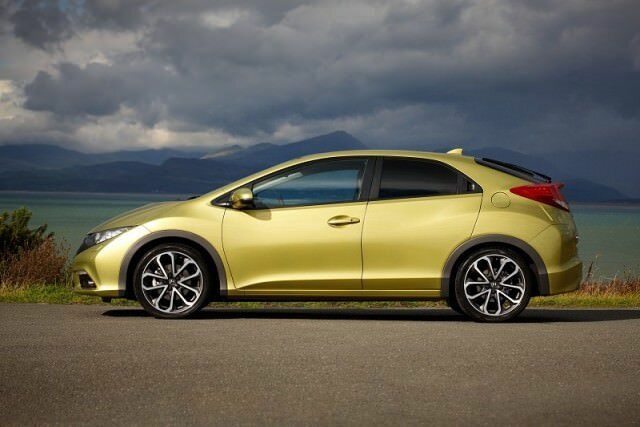 The ninth generation of the Honda Civic makes a great alternative to the default hatchbacks. You could be forgiven for thinking that the so-called ninth generation Civic, sold in Ireland from early 2012 until the start of 2017, was merely a facelift of its predecessor, but while it kept that car's futuristic styling and proportions, plus the basic chassis design, it was in fact an all-new car. Crucially, it felt very different. For starters, visibility out back was better, if still compromised by the standard spoiler, and the interior retained the company's great 'Magic Seats' inside and one of the biggest boots in the segment. Quality and refinement were high, the Civic drove with real enthusiasm and its engine options mixed decent performance and efficiency to good effect. Some didn't like the less than conventional exterior design, and that also applies to the multi-layered dashboard, which takes a little getting used to. The ninth generation Civic was produced as a five-door hatchback and an estate only. At launch in Ireland at the start of 2012, the Civic was available with an underwhelming 1.8-litre petrol engine and a powerful 2.2-litre turbodiesel. The latter was undoubtedly preferred by Irish buyers, though many considered its capacity to be too high for such a compact car. Nonetheless, it still returned good fuel economy, even if it wasn't the quietest diesel around at low speeds. Honda released a 1.6-litre diesel the following year and it has proven to be a success; it's definitely the one to go for, though there's also a modest little 1.4-litre petrol engine for those that spend most of their driving time in town. Trim levels started out as SE, ES and EX and you'll find most on the used market are ES. If you fancy something sportier looking then keep an eye out for the Si version, while well-heeled petrolheads will hanker after the full-blooded Civic Type R.
A budget of under €16,000 should secure you a properly maintained and relatively low-mileage Civic 1.6-litre diesel in the ES trim level. If you're in the market for a family hatchback and you've only considered the default options such as the Ford Focus and Volkswagen Golf then you really should check out the ninth generation Honda Civic too, as it's just as good to drive as those, more spacious, probably better equipped and more reliable for the same money. The only stumbling blocks are image and whether you like how it looks inside and out.